The weeping willow has different meanings for different people. You may decide to get it for symbolic reasons or you may just get it because you want to be able to look at a willow tree tattoo whenever you like. Whatever your reasons, knowing the symbolism will deepen your appreciation of the tattoo. 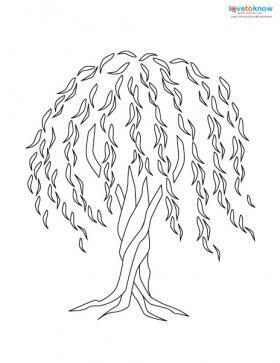 Memorial: One popular reason for getting a willow tree tattooed on your body is to commemorate the life and death of a loved one. Make the tattoo specific to that person by adding text around it in either banner form or script around the tree. You don't need text to make the tattoo a memorial; all you need to do is dedicate the tattoo in your heart. Mythology: The willow tree is a meaningful symbol in Celtic mythology. For those who hail from the British Isles, this may be a powerful reminder of your roots. The Druids of the ancient British Isles used these trees in their ceremonies. You don't have to be of Celtic descent to have such symbolism resonate with you or to get a tattoo of this tree with meaning to those people and their culture. Literary: Think of the properties of the willow tree; it is pliant, yet strong enough to weather even the fiercest storm. It can take on just about any pose without snapping. Perhaps you admire or would like to emulate the qualities of the willow tree. This is another reason you may want to get a tattoo of a willow tree. You can put the willow tree just about anywhere on your body, and in a number of forms. Arms are a place that are highly visible anytime that you wear a short-sleeved shirt. Legs are more private, as are parts that are always covered by clothing. You also have the option of a flat or a round tattoo; if you get the tattoo on your back it will be a flat design, while if you get the tattoo on a rounder part of your body, such as an arm or a leg, you can have the tattoo wrap around your body. The back is a large, open canvas that some people choose to cover with a tattoo of a willow tree. Carefully consider where you wish to have the tattoo placed before you make your appointment. Placement will heavily influence how the artist will draw the tattoo. A round tattoo where the root system of the tree balances the branches. A tattoo done in the style of your favorite art period, such as art nouveau or art deco. A design from a book of clip art or old graphic design art. The possibilities are limitless once you start thinking about it. More creative-minded people will be able to come up with more out-there ideas. The artistically inclined can also sit down and draw their own tattoo, conjuring up an idea in their mind and putting it down on paper. Those who aren't sure where to begin can always sit down with the tattoo artist for a consultation before getting inked. No matter what you decide on, you will have a piece of art that will be with you for life.